The fight and arrest on a charge of underage possession of alcohol early in the morning of Jan. 4 at Athens Ridge, the student housing complex on Old Macon Highway, was an exception, a review of records of the Oconee County Sheriff’s Office shows. Going back to when the townhouse complex opened at the beginning of the academic year in August, records show only one other incident that clearly involved alcohol. That event also was this year, on the morning of Jan. 1. Shortly before 3 a.m. on Jan. 4, Sheriff Deputy Matt Towe responded to several 911 calls about a fight underway at the student complex that involved 20 to 30 males. Towe arrested Nicholas Bryant, 18, Lawrenceville, and charged him with underage possession of alcohol, a misdemeanor. When Towe arrived at Athens Ridge, he saw several people running from the intersection of Athens Ridge Boulevard and Black Oak Drive toward the pool area at the rear of the complex, according to the Sheriff’s Office incident report. Towe reported that he saw a male wearing a t-shirt that was ripped and had blood on it. The individual was not wearing shoes. The individual reported that there had been a large fight and that the others had run off before Towe arrived. The individual told Towe that he had been in downtown Athens and had consumed alcohol. He also told Towe that the fight had started on the bus coming back from Athens. 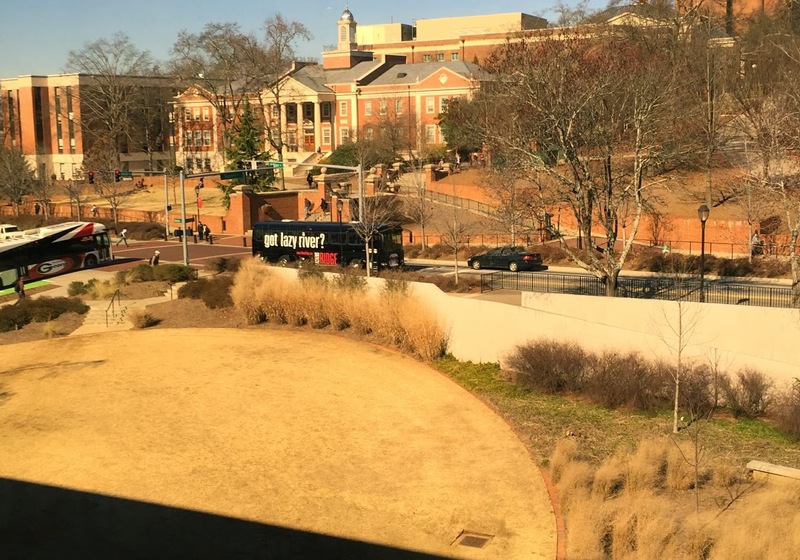 According to the web site for the complex, Athens Ridge runs shuttles to and from downtown Athens from 10 p.m. to 2:30 a.m. Thursdays through Saturdays. Shuttles also run to campus during the day. Athens Ridge has 190 units and was fully leased as the school year began with 787 residents. Athens Ridge Boulevard runs from Old Macon Highway through the center of the complex. Black Oak Drive and Redwood Lane parallel Athens Ridge Boulevard but also loop around to cross it. The community is gated, and the roads are private. Deputy Towe reported that he arrested Bryant and took him to the jail in Watkinsville. Chief Deputy Lee Weems said that Bryant posted $500 bond at 4 a.m. on Jan. 4 and was released. Weems told me that the Sheriff’s Office has been pleasantly surprised by the few incidents involving Athens Ridge. The incident on July 1 involved a male who entered an unlocked apartment in the complex. The woman told the deputy the individual was drunk and disorderly but had left before the deputy arrived. Bryan Neil Chaffin, 23, Loganville, subsequently was charged with drunkenness, obstruction of the law and criminal trespass. In the future, the students won’t have to go to downtown Athens for their entertainment. Site preparation continues at The Falls of Oconee, a small shopping center across Old Macon Highway from Athens Ridge. Both the student complex and the shopping center property are owned by the same Michigan company. Plans are for the shopping center to contain several restaurants. The shopping center is in the area of the county where restaurants can have a license to sell beer, wine and alcohol. So far, only preliminary site plans have been filed for the shopping center, and no building permits have been issued. The county did receive a copy of a letter from the Georgia Department of Natural Resources dated Dec. 15 indicating that the underground storage tanks that had been on the site have been disposed of and the site had been cleared for construction. A convenience store and gas station had been on the site. A fight with 20-30 males? A drunk male entering a women's apartment? A shuttle bus running from Athens bars until 2:30 am? Now Melvin Davis and Jamie Boswell want to see establishments serving alcohol across the street? Do you know how dangerous it would be to cross Macon Highway at night after some drinks? Thank you Melvin and Jamie for putting Oconee on a path of no return. Subscribe to Oconee County Observations Via Feedburner By Clicking Below? If you want me to add you to my listserv, simply send me a message at lbbecker@mindspring.com. You can follow me on Twitter @lbbecker. You can friend me on Facebook. Videos From Meetings Around The County Are Organized Into Channels On Vimeo. This Is A List Of The Channels. Videos used to supplement this blog are on Vimeo, organized into channels. All videos are under the Oconee County Observations Channel, while other Channels contain videos organized by subject matter. Links to a few specific videos are below. * A tour of the Calls Creek Water Reclamation Facility. * Presentation by Don Martin on citizen involvement in SPLOST in Athen-Clarke County. * Dedication Of A Historic Marker For The Oak Branch Fairgrounds And Branch Family Home. Ph.D. University of Wisconsin--Madison, Mass Communication (1974); M.A., University of Kentucky, Communication (1971); B.A., University of Kentucky, Journalism (1969). This is a news blog, following in the established tradition of the newsletter. I'm a citizen of Oconee County. My experiences and aspirations for the county have influence on what I post here. I strive to be accurate, fair and transparent. I want to reflect events and discussions, using links to document what is known. I want to offer a balanced presentation that recognizes different points of view and portrays the people involved with respect. I want to tell how I learned what I have learned and be clear about any role I have played in what is being presented. Comments are encouraged. I attempt to apply the standards of accuracy, fairness and transparency to them as well. Oconee Patch often runs a short version of postings from this site, with a link to the full post here. This blog is otherwise independent of Oconee Patch. I often use video from county meetings on this site. I or others on my behalf have recorded these videos. These video are stored either on my channel on YouTube or my channel on Vimeo. On May 6, 2008, Charles Baugh, Tony Glenn, Russ Page and I asked the Board of Commissioners to begin recording meetings and to make the recordings available to the public. We indicated we would record meetings and upload the video whether or not the Board decided to do so. On May 27, 2008, County Administrative Officer Alan Theriault announced that the county would begin recording meetings. Those recordings can be viewed at the county's Vimeo site. A link to that site appears in the left-hand column of the BOC page of the county web site. A calendar of meetings in the county appears on the front page of the Oconee County web site. Nydia Tisdale went to Burt's Farm in Dawsonville to record the speeches by political candidates for her website AboutForsyth.com. A summary of what happened next is available here. This is Tisdale's video recording of the event. The last four minutes are the most important--and hardest to watch. Here is an MSNBC report in which Tisdale explains what happened and where things stand with her arrest. And here is a report by Brian Pritchard of FetchYourNews, who was present and shot some photographs of what happened as well as made an audio recording. The Association for Education in Journalism named me the 2013 recipient of the Paul J. Deutschmann Excellence in Research Award at the association's annual conference on Aug. 10, 2013, in Washington, D.C.
A video clip from a special session at the conference for the the Deutschmann Award is available on the Oconee County Observations Vimeo Site. The Oconee County Democratic Committee honored me on June 20 as one of 15 individuals making a contribution to the quality of life in Oconee County. Dan Matthews, chairman of the Committee, cited Oconee County Observations in making the award. Others honored included potters Kathy and Jerry Chappelle, Courtney Gale from the Athens-Clarke County Police Department, Peggy Holcomb, Oconee County director of tourism, Chuck Horton, former county commissioner, Melissa Steele, a local artist and blogger, and Vinnie Williams, owner and publisher of The Oconee Enterprise. The Committee also honored the Jeannette Rankin Foundation. I was given the Doctor Honoris Causa by the Senate of the National School of Political Studies and Public Administration on Dec. 4, 2012, in Bucharest, Romania. The Athens Banner-Herald wrote a story about the award. Here’s what 1340 WGAU journalist Tim Bryant said about Oconee County Observations during an interview with me on March 30, 2010. Oconee County and the Athens Banner-Herald are the subject of a piece several minutes into the Colbert Report on Sept. 12, 2011.